when they participate in production of multimodal texts based on Art Encounters? Formation «Bildung» contains in its classic form two elements: the «The individual strength and expression, and the cultures force and influence» According to Løvlie (2003), is there a third element, the transformation, the poetic «refinement» of the relationship between personality and culture. With this view, the formation concept is inspired first and foremost in the expressive and poetic creative human. This project are within the qualitative, interpretive research methodology. These are studies with few informants selected from children and teaching staff in the kindergarten departments. This is a formative research project in which 12 children in a kindergarten has created multimodal texts on the basis of Art encountering. In the children’s work with the multimodal texts, digital tools have been used. 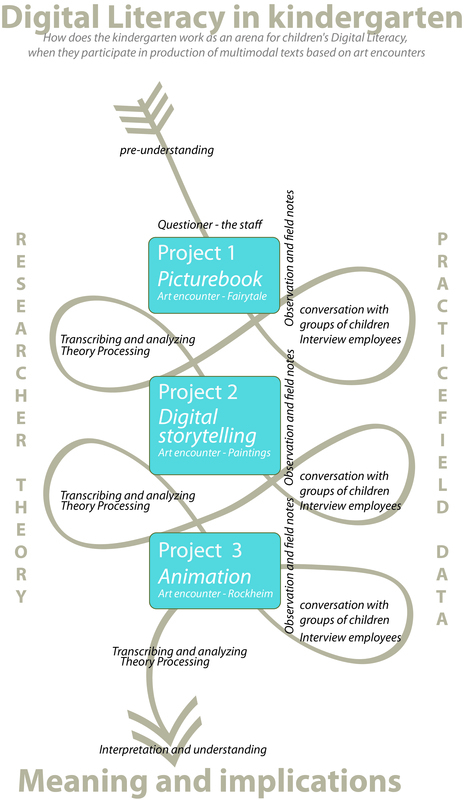 The thesis will highlight the process from the art encountering, via digital tools into a complete multimodal text. The processing of the data is given a narrative form to present the participants experiences and reflections through narrative analysis. In this study encountering the art initiate the children’s meaning making in the face of their own expression, while the digital tools are one of the framework factors related to children’s situated expressions. By letting the children gain experience with digital tools by creating multimodal texts they will develop their digital literacy. The children get to participate in transformative learning processes and experience different forms of aesthetic practice, by working practically and actively with art. It is a activity that takes place at various arenas. The digital tools allow the children repeatedly encounters with art, in addition to this the tool helps the children in their aesthetic considerations related to the multimodal texts’ relationship between form and content. This gives them several opportunities to create meaning, both relating to their creation of texts and regarding to the world around them. In this context, the PhD Thesis would like to discuss and highlight the role of the digital tools, the art encountering, creating of multimodal text and situated expression.